We have acquired something big and precious during the Convention: We have discovered for the first time that Pharaoh is sitting inside us and hates us, and we have to get rid of him, to run away, to exit Egypt…but are incapable of it. We would have never realized that we must run away from him. We hoped that we could reveal spirituality in our egoism, in “Egypt.” But we did not even think that this is “Egypt.” Yet now we are beginning to understand that we must break free from it. Our egoism, Pharaoh, received a blow, and this disappointment passed through him. Now we see that we have to distance ourselves from the desire in which we reveal disappointment and bitterness. However, had we not gone full out till the end, we would not have felt disillusionment; we would have sensed that, truly, something is stopping us. There is no middle ground in spirituality; we have to go till the end. Hence, now a certain new sensation has manifested in us. That same disappointment, the force of suffering that we now feel (since I invested so much effort, had so many hopes, and nothing happened) is my Pharaoh, who received a beating and is now suffering. However, the Pharaoh has to feel the beatings since otherwise we will not be able to run away from it. Indeed, we run only from evil. We achieved this only because we nevertheless united between us. One is always revealed against the other, as it is said, “in Your Light we will see the Light.” Thanks to this unification and our preparation, we realized that we suffer because of our egoistic nature. And this is a big achievement! Millions of people who participated in the Convention virtually were together with us. They, too, went through the same states. The first 9 Sefirot are the properties of the Creator, and Malchut is the desire to receive pleasure with regard to the creature. How then can Malchut receive the Light at all? It can do so only due to the fact that all 9 Sefirot are included in it. Malchut absorbs all 9 Sefirot and becomes the 10th Sefira. In other words, the creature, Malchut, becomes like the Creator. All 9 Sefirot, His properties, enter Malchut. This is achieved by way of mutual inclusion. We study that all our work lies between Malchut and Bina. Malchut rises to Bina and is included in it. And then Bina descends into Malchut and includes itself in it. Due to this mutual integration of Bina and Malchut, we receive an opportunity to correct ourselves. After all, Malchut, per se, is an egoistic desire to receive pleasure, whereas Bina is the desire to bestow. Thus, their mutual integration into each other brings the properties of the Creator to the creature. To the degree that we ascend to Bina while desiring to become similar to the Creator, the Creator is able to descend to us and bring us to His properties. Question: I try very hard to cross the Machsom (the barrier separating us from spirituality), but Pharaoh always wins. At a certain point, I lose faith and unite with the group only out of habit, not genuine aspiration. It makes me angry. What shall I do now? Ask the Pharaoh to let me pass to the Creator? Answer: No, you should beat him. He hates you and does not let you pass through to the Creator. He is standing between you two. However, Pharaoh straightens out this lack of correspondence. You exert pressure, he gives you blows; you exert pressure, he gives you blows, again and again. Due to these beatings he shapes the clod of your desire into the desire to bestow (Tzura Melubeshet Be Homer). We think that there are bad forces in nature, but in reality, it is not the case. When the property of bestowal will reign within me, I will discover that there is no evil, and all negative factors were called to form out of me the desire to bestow. They are all help from Above. As soon as I assume the form of bestowal, they will have no reason to pressure me any longer. We just need to understand how to work with these forces. The faster we do, the sooner we will acquire a new form and will be born. Question: Baal HaSulam writes that a person will reveal the Creator only out of despair. Does it mean that at a certain point we have to yield, to refuse to continue fighting? Answer: No, we do not yield. We fight to enter the spiritual world by our own forces. And then we despair of our power and understand that we cannot break through the Machsom (the barrier separating us from spirituality) on our own. But it is only then that we truly feel the need for the Creator, evoke His force, and break free from the imprisonment. It is impossible to feel the need for the Creator until we despair of our own efforts. Now we want to unite, change, and straighten up our relationships by ourselves, by our own power. We try to act by ourselves, as if the Creator does not exist. However, when we truly desire to draw closer to each other, we will understand what we felt slightly during the Convention: We are incapable of it. Everyone is separated from the others by a partition, and he cannot break through it. Each is sitting in its own cell, like bees in a honeycomb, isolated from the others. When I want to break free from this cell, when I exert all the effort and understand that I am helpless, then it will become clear to me that there is the Creator who can give me strength and save me. I read about and heard of Him before, but He was not in the field of my desires and aspirations. He was not my partner yet. Now I felt for the first time that I’m helpless without Him. This is how the Creator awakens the Pharaoh within me. After having experienced a few such actions, I realize that I cannot break free without Him. As soon as I will feel it, I will cry out to Him, and He will immediately “un-bolt the door” for me. My entire work is to desire the Creator, to want Him to manifest within me and change my nature, to want His force of bestowal to clothe me. The Zohar, “Introduction of The Zohar,” Chapter “BeLaila De Kala (Night of the Bride)”: … the members of the bridal chamber must be with her on that night and rejoice with her in the corrections that she is corrected…. Question: What is the criterion of our advancement? Is it hatred that becomes revealed to us in the beginning or the opposite, joy? If a persistent demand to reveal that place lives in me, then I’m glad for the effort that I can exert constantly. And it’s not important how often I stray, forget, or get distracted by a rational analysis. It is said about this, “From Zion shall go forth the Torah.” In other words, advancement is comprised of these exits (Yetziot) from the attempts to re-define the place of our unification. Each time I have to lose my concentration. After all, any state consists of 10 complete Sefirot. In spirituality, an action is performed only if all the 10 Sefirot are present (Ein Mi Ksat Be Ruchaniut). If I correct something, I have to correct a full measure. Each part of the desire demands separation from the previous state and a new approach to unity, to a new 10 Sefirot. This is why we disconnect from the goal again and again, even if it just for a split second. Time after time we lose the target and catch it again at the crossroads. Due to these efforts at night we “adorn the bride” (clothe her in the Light of Hassadim [Mercy]). That is, we build the Kli (vessel) until it becomes fully disclosed and ready to accept the groom, the Light of Hochma (Wisdom), the Creator. 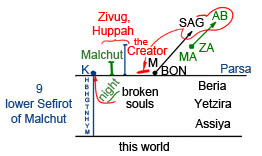 Our broken souls as well as the lower nine Sefirot of Malchut of the World of Atzilut are located above this world in the Worlds of Beria, Yetzira, and Assiya. The Keter of Malchut is located on top, in the World of Atzilut, and represents just a point. The remaining nine Sefirot are under the Parsa, in the Worlds of BYA. The state of the souls in the Worlds of BYA are called “night.” By rising to Malchut of the World of Azilut, they compel Malchut to raise her nine lower Sefirot which now remain unnoticed in the darkness. To the extent that we connect to Malchut, she starts raising its Sefirot to Atzilut and becomes a Kli (vessel). This enables her to connect into one whole with Zeir Anpin (ZA), which is called Huppah (a wedding canopy or cover, the Masach [screen] under which the Zivug [union] or a wedding ceremony takes place). In other words, we are talking about connection, Zivug. ZA is called the Creator, while Malchut, Shechina. Their unity is what we need to achieve. When does it happen? By raising our desires to Atzilut, we instigate the ascent of all the worlds. Malchut (BON) rises to the degree of SAG, while ZA (MA) to the degree of AB. This is their future. We attain and feel all of it in our unification. From the level of the Zivug of AB-SAG, we receive the Light and fill our souls that are located below, in Malchut.